It’s getting more common for sign-up forms to validate the format of passwords, and then give visual feedback on the password’s content or strength. The idea of having that checklist is to reduce friction for users, by providing specific feedback on the format that’s required, rather than simply rejecting the password on vague or unspecified terms. But it’s still a bad idea, however well it’s implemented, because it propagates a misleading view of what constitutes a good password. To understand this issue, we need to begin by understanding how a password’s strength is determined. The strength of a password is typically described using the term password entropy , which is a measure of its randomness. It’s not so much a measure of that specific password, as of all the possible passwords which contain the same range of characters (i.e. all the possibilities a computer would have to try in order to crack it by brute-force). Entropy is usually expressed in bits: if we refer to a password as having n bits of entropy, it means that the entropy value is 2 to the power n. A single lower-case English letter has approximately 4.7 bits of entropy, because 24.7 is approximately 26. So if a password only contains lower-case letters, then each will add another 4.7 bits of entropy (i.e. a two-letter password will have 9.4 and so on). If we replace one or more letters with other characters, then the range (and therefore the entropy) will increase. There are 94 non-diacritic letters, numbers and special characters in US ASCII, so each will have approximately 6.55 bits of entropy (because 26.55 is approximately 94). Therefore an eight-letter password which might contain any of these characters will have approximately 52.4 bits of entropy, whereas a password of the same length with only lower-case letters will have 37.6 bits of entropy. However a sixteen-letter password with only lower-case letters will have 75.2 bits of entropy. To put that into some kind of context: a password with 52.4 bits of entropy might be cracked by a desktop PC in less than half an hour, while a password with 75.2 bits of entropy could take several hundred years. The longer the password, the more time it takes to crack, exponentially. So in general terms, a long password with nothing but lower-case letters is better than a short password with a mixture of characters. This throws a different light on what constitutes a good password. It means that this is my password is a much stronger password than pA5%w*rD , and yet it’s so much easier to remember. Although we must concede that there is a problem with this way of analysing passwords, which is its assumption that every character was randomly chosen. In practice that’s seldom the case, since passwords are usually chosen by people, and people don’t make random choices. One example of non-random choices is psychological traits — the tendency of people to use obvious words, celebrity names, or common associations. Password-cracking software might take account of such things to optimize its work, and produce results more quickly than is mathematically probable. But it’s not really possible to quantify this when calculating password entropy, because it requires knowledge that can’t be easily abstracted. Though the Gmail validation tool clearly does takes account of some of these things, since it indicates that this is my password is weaker than this is my whatever , simply because it contains the word password . But it also indicates that pA5%w*rD is stronger, even though it’s actually very much weaker (as we’ve seen). And this is the problem with all the password-validation tools I’ve seen — character substitution is given far more emphasis than it deserves, while creating a longer password is given little or no emphasis at all. They’re teaching users to create passwords which are hard for humans to remember but easy for computers to guess. I said at the start that the Gmail tool was quite a good example, and that’s because it assesses the overall password rather than just its individual characters, so it will at least indicate that a longer password is stronger than a short one. I also said that the second example was a bad idea, and that’s because it only highlights character replacement, which is nowhere near as important, and potentially counter-productive. I can remember once or twice being forced by a site to choose a different password, simply because it didn’t have a mixed-character format. As a user, I found that incredibly frustrating; but it’s also doubly ironic, since it could end up making people use a shorter, and therefore weaker password, or to use the same password for many different sites. I would advocate two separate fields — one for the password and one to confirm — along with some notes underneath that explain how to write a strong yet memorable password. Both fields are required and must have a minimum length (and obviously must be the same), but the password’s character format isn’t validated or required. 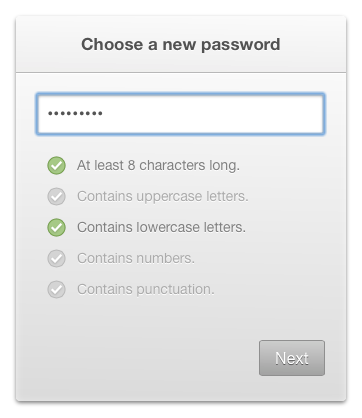 Because ultimately, it’s up to users what kind of password they want to use. As service providers, it’s our responsibility to maintain the security of our users’ accounts. If we’re using techniques like salting and key stretching to store passwords more securely, then it shouldn’t really matter what they choose. Personally, I like to use old phone numbers and places I’ve lived. For example, if I lived in New York and I can still remember my phone number there, I might use “New York 219 555 4209” as my password. That’s immensely strong, but also easy for me to remember. A more general approach is to take several words that are not commonly associated, and then visualise an association between them (like that xkcd cartoon). Simply forming a visual association makes the password more memorable, especially if it has a personal meaning for you; and if it’s all in lower-case letters then you don’t need to remember any convoluted replacements. It’s easy to imagine some kind of TV drama situation, where Sherlock Holmes is sitting at our computer, trying to guess our password using psychological insights. Do we like Star Trek, drink Yorkshire Tea, or listen to Iron Maiden? In that case “ir0n//ma1d3n” would be harder to guess than “iron maiden” (though not by much, given Holmes’ inevitable knowledge of common substitutions!). But that’s not going to happen anyway, and users may need to be taught to understand this. Passwords are almost never cracked by people with personal knowledge, they’re cracked by computers with brute-force — and for them, size is everything!